Ash Banaszek is a passionate and outspoken UX advocate at Union Pacific Railroad. 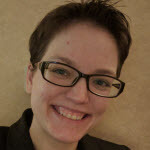 She holds a masters of science in information science from Missouri University of Science and Technology in Rolla, MO and returns to her alma mater regularly to guest lecture in human factors and human-computer interaction courses. Ash is also an award-winning Toastmaster and uses her public speaking experience to infuse humor and thought-provoking questions into her talks. You can follow her on Twitter @ashbzak or linkedin.com/in/ashmb, or meet in person for lively conversation at a UX Happy Hour Book Club Meetup in Omaha, NE.